I have written before about active transportation (AT), which is most ways of getting around besides driving in a car. Walking, cycling, skateboarding, roller-skating or -blading, possibly blended with transit. (Barrie’s buses will soon feature bike racks to extend your bicycle range throughout the city). AT benefits our health, environment, and economy, so getting around actively is a win-win-win. While Barrie is subject to the same frustrating institutional inertia of car-centred street design as most North American cities, there is good news, too. On the Active Transportation Barrie (ATB) working group, a stakeholder committee stretching back 4 years, I’ve witnessed the growth and spread of many new specific initiatives as well as an overall shift in attitude. Barrie’s plans now take more account of AT when building new neighbourhoods or redeveloping existing streets. Bike lanes aren’t multiplying like rabbits yet, but bus bike racks and bike lockers at key locations are a sign of things to come. Starting the season off right, Mountain Equipment Co-op and ATB partner up for MEC Bikefest on Saturday, May 26. The fun starts downtown at Fred Grant Memorial Square, which will be closed to car traffic. This free, family-friendly event features special group rides, cycling vendors and clinics, and the chance to try out various bikes even if you don’t have your own. Group rides led by event co-sponsors include Mountain Biking 101 with Hardwood Hills at 11:30 AM, a family ride with the Barrie Cycling Club at 1 PM, and Georgian BMW/Mini’s ride at 2:45. Monday, May 28 marks the start of Cycling Safety Week in Barrie. Monday will also be Barrie’s Bike to School/Work Day, and we challenge all of our community members to participate, asking employers and educators to help facilitate rides to and from places of work. We will be arriving on bikes at City Hall around 6 PM as Acting Mayor Councillor Robinson raises the new ATB flag at City Hall for the week, and signs the International Charter for Walking. I encourage you to ride to City Hall to witness the flag-raising and signing; afterward, members of the Barrie Cycling Club will lead a slow, social, family-friendly ride around the lakeshore & back to City Hall. If a person, family, business, school or organization you know has made a special contribution supporting AT, you can nominate them for Barrie’s Active Transportation Award. Past recipients have been the Walking School Bus at Johnson Street Public School and Barrie Central’s Firebird Community Cycle. 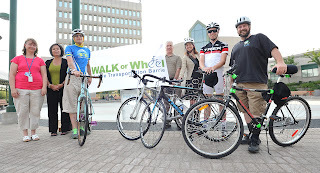 For information, visit the Active Transportation page on Barrie's website. We encourage all citizens of Barrie to bike to work or school this Monday, or join us to raise high the Active Transportation Barrie flag! Published in my Root Issues column in the Barrie Examiner as "Active Transportation of great benefit to Barrie"